By Dan Ambrose: While Golden Boy Promotions CEO Oscar De La Hoya has said that he wants to put on the fights that the boxing fans want to see, one fight that they might not get a chance to see for a while is a match-up between Golden Boy flagship fighter Saul “Canelo” Alvarez (45-1-1, 32 KOs) and IBO/WBA middleweight champion Gennady Golovkin (33-0, 30 KOs). De La Hoya didn’t come right out and say that a fight between Canelo and Golovkin won’t be happening, but he did drop a very big hint that the fight probably won’t be happening anytime soon. De La Hoya said that Canelo can still make 154 easy despite the fact that he hasn’t fought at that weight since 2013, and has been ballooning up to 175 after making weight at 155 for his last three catch-weight fights at that weight. Further, De La Hoya says that Canelo and WBC middleweight champion Miguel Cotto could wind up facing each three times in a trilogy bout. 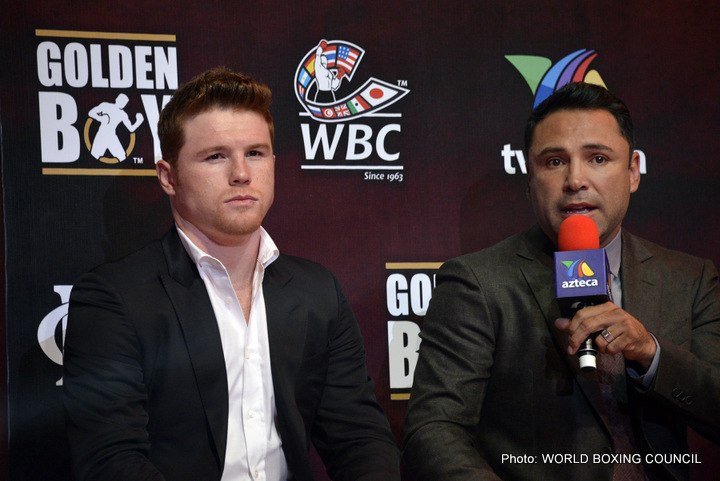 “Canelo can make 154 easy, so we don’t know what’s going to happen,” De La Hoya said via Fighthype. “Can there be another fight? Can there be a trilogy? We don’t know what’s going to happen, but one thing is for sure Canelo does want to make 154, and can make it relatively east. When he’s ready to make 160 solid, he’s going to fight anybody. He’s not afraid of anybody,” said De La Hoya. Canelo weighs 175 after he rehydrates. I don’t see how he wouldn’t be solid if he started fighting at the full weight at middleweight of 160lbs. 175 is very solid for the middleweight division. I get the impression that De La Hoya is making excuses for Canelo to keep him from having to take a very tough opponent in Golovkin that he might lose to. When you have a promoter like De La Hoya talking about Canelo being solid some day at 160, when he’s already fighting at 175, it just comes across like he’s an enabler. What’s not known is whether those three fights would come consecutively one after another or would be spread out over time with other fighters getting a crack at the two fighters in between. Given Cotto’s advanced age, I don’t know that he’s going to be able to fight too many other fighters in between if they plan on fighting each other three times. Cotto will be turning 35 before he faces Canelo on November 21st on HBO pay-per-view from the Mandalay Bay Resort & Casino in Las Vegas, Nevada. I don’t think Canelo can make 154 easy. If he could, he’d be fighting at that weight rather than draining down 20 pound to fight at 155. I think it’s very difficult for him to get down to 154 for his fight, which is probably why he keeps fighting at 155, because that last pound is difficult for him to take off. There are not a lot of fighters who drain down 20 pounds to make weight without it leaving you weight drained. Canelo is able to lose the weight and put it back on without being sluggish. However, Canelo is clearly a middleweight, and has been for a long time. He’s just able to lose tremendous amounts of water weight without it hurting him yet.